Keeper teaches readers that doing something different could change your entire life. Keeper by Mal Peet is a book about a soccer player named El Gato who is the goal keeper for the World Cup’s winning team. In this interview with Paul Faustino, El Gato tells his life story and how veering off a path in the woods resulted in his figurative transformation from a gangly, uncoordinated boy to one of soccer’s greatest stars. Flashbacks throughout the interview explain how he learned to play soccer, what it was like growing up, and about the loss of his father. The reader learns about the people he meets along the way, what his parents thought of him, and what they wanted him to be. 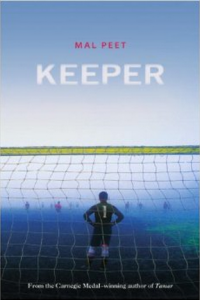 Mal Peet’s Keeper is the perfect novel for soccer lovers looking for an novel with well developed main characters and an interesting plot. The character development in Keeper is fantastic. For example, when El Gato first traveled off the path in the forest near his home and saw the Keeper for the first time. The Keeper is a goalkeeper and you don’t know if he is in El Gato’s mind or if he is real. I felt like I was in the book, because of Peet’s description of the way El Gato behaves. Also, how he was speechless in amazement of the Keeper and how he was standing in the middle of the clearing “as if he came from the forest.” Another example is when El Gato accompanied his father to the soccer game and saw that one team did not have a goalkeeper. Since he seems pretty shy most of the story, it was surprising when he stood right up and walked up to the goal as if he was meant to play in the that game. This shows how El Gato changes from a boy who is shy and scared, to a boy who is not afraid to stand up and help someone else. A reason to love this story was its amazing plot. The book went back and forth between El Gato telling his story, and his conversation with Paul Faustino about his life tale. This plot was interesting because it showed El Gato’s story from two different points of view and time. If you are looking for a well developed characters combined with the action of soccer, Keeper is for you.